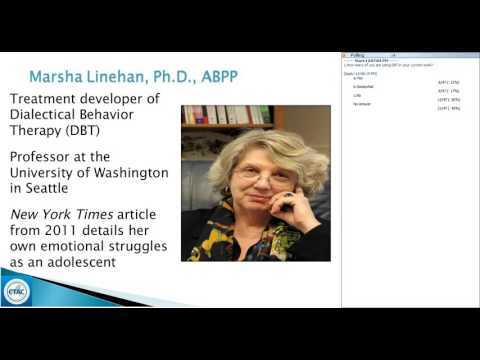 Dialectical Behavioral Therapy (DBT) was developed by Marsha Linehan in the 1990s as a treatment for adults with borderline personality disorder. It includes facets of cognitive behavior therapy, skills training, mindfulness meditation, behaviorism, and dialectics, and is structured to help clients gain insight and skills to manage their thoughts, emotions, and behaviors. Four skills modules are emphasized in DBT training: mindfulness, emotion regulation, interpersonal effectiveness, and distress tolerance. Many adolescents and transition-age youth struggle with symptoms of emotion dysregulation such as non-suicidal self-injury, suicide attempts, dichotomous thinking, impulsive behaviors, labile moods, and unstable interpersonal relationships, symptoms that are seen in adults with borderline personality disorder and that are effectively treated with DBT. DBT has been adapted for use in adolescents by involving parents/guardians and by teaching the adolescent and their parent/guardian to think and behave dialectically rather than in extremes.